Yes, we’re back at Ramos Arizpe,with the noise of Mex 40 making this the worst accommodation of the trip. But it’s on the way to tomorrow’s planned stops, so what. Apologies to those who also read Ian’s email reports, from which they will have learned that my companions are behaving like a special needs group outing; leaving things at the hotel, joking with heavily armed soldiers at check points, talking to Yuccas (never talk to strangers Cliff, wait until they introduce themselves) and people who open gates and then lock themselves out as they close it. Our hotel in Ramos Arizpe is the same as previously reported as being in Saltillo. The two towns have grown together with industrial development along MEX40. A good place to leave soon after breakfast! 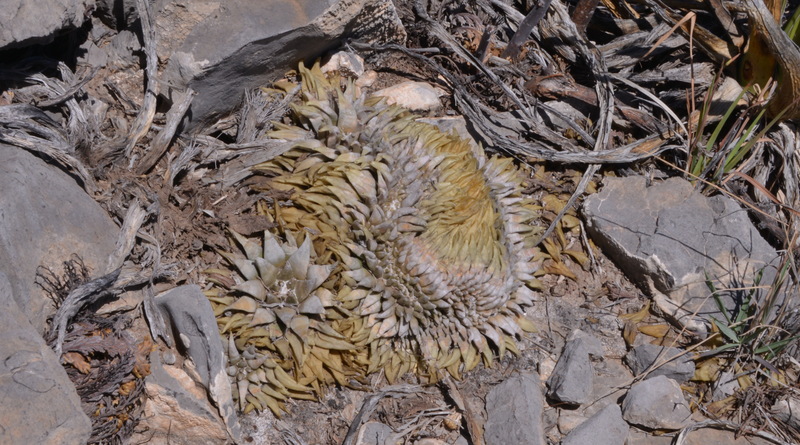 I had made a request to revisit a stop where in 2010 I had seen the most magnificent crested Ariocarpus retusus. That time we had just driven to the location where Eunice and I had climbed the hill to one side of the track while John Bleck had ventured to the other side where he found the plant. This time (S3094) we approached the site through a series of gates, the last one of which was bolted, we approached the site on foot and so I missed my friend from 2010. Still found lots of interesting plants which had their picture taken, including another, not quite so spectacular crest. 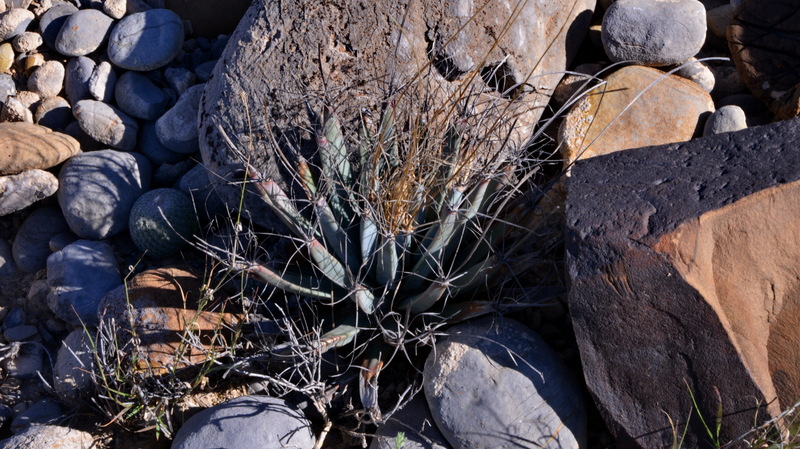 Again, there was an interesting mix of cacti_etc that crossed our camera lenses: Agave lechuguilla, A. sp. Ario resusus, Coryphantha sp x2m Echinocereus enneacanthus, E. longisetus, E. pectinatus, Epithelantha micromeris, Ferocactus hamatacanthus, Fouquieria splendens, Mammillaria sp, Sclerocactus scheeri, Selaginella pedidophylla (resurection fern) and Yucca sp. The second and last stop of the day (S3095) was again at a place I had visited in 2010, as it had Leuchtenbergia principis growing there. This is a plant that we had probably walked by a dozen or more times on our trip, but which is so well camouflaged, by looking dead, that unless you look for it specifically, you miss it. Ian found a young seedling, looking as though it had just arrived from a Dutch nursery, but had walked straight past the parent, an undamaged specimen that would have caught admiring glances if it had been displayed on a showbench in the UK. Of course the plant stayed where it was born, in Mexico, for others to admire it, should they pass. 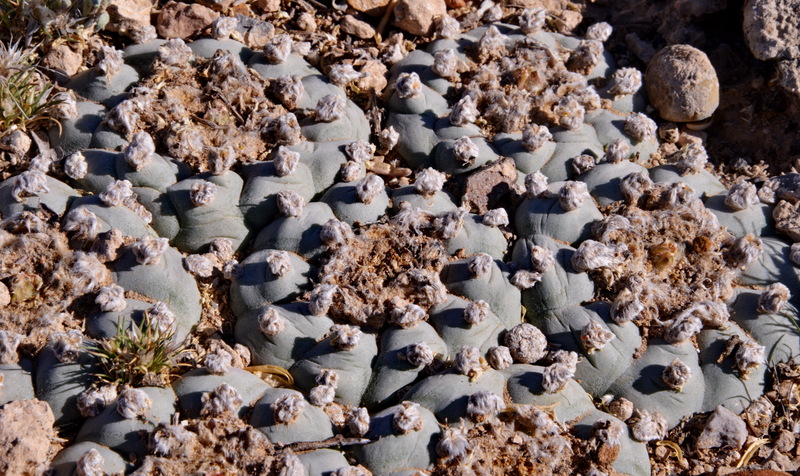 The Lophophora williamsii found here (by Ian) was not bad either, enough to make your mouth water!